Broombusters cut broom in bloom. That is usually mid-April through early June, depending on the season and location. The following PDF is similar to a Powerpoint shown during delegations to municipalities. Pre-arrange cut broom removal FIRST. Contact Broombusters for advice, but Broombusters is not responsible for what you cut. But there are ways in every situation. Where do you want to cut? Stop the spread first. Start with the light infestations, outliers, pioneers, the advancing edge. Move towards the denser areas. The initial goal is containment. Stop the spread. Draw a line: “The broom stops here!”Gradually, you’ll get to the denser areas. Pick a few specific places that you care about, where you can be successful. Pick focus areas for each year, so pick up and maintenance is manageable. Perhaps cut near your home, so you can enjoy seeing the native plants and grasses again – all year long. Is there a Broombusters group active in your area? Contact your area organizer. Cuts listed on thewebsite are constantly updated; also, there are often additional cuts. Go to a community cut first to learn how to cut broom properly and sign waiver forms. Be aware –Broombusting is addicting! Cut at your own risk. Pick your style: Some volunteers come to a group cut – two hours a year. Others come out many times each season. Others adopt a road, park or area and work on that area extensively and exclusively. Everyone is needed; everyone is appreciated! No Community Group where you live? Contact Broombusters. We’ll talk about how to get a group started. Broombusters goes to where volunteers are interested. We need Broombusters all over Vancouver Island and surrounding islands; and everywhere on the lower mainland. A partnership between a town and Broombuster volunteers is effective and inspiring. If community members are given permission, tools, instructions and appreciation, they want to take care of their local ecosystem. Our goal is to educate and empower local people, so that they can become effective stewards of their own neighborhoods and parks. People cut where they live and when they have time. What is needed for a city to adopt Broombusters model? Broombusters is an umbrella non-profit society. Our goal is to do the complicated desk work – design signs, website, handouts, information sources, media, radio spots, etc.- so volunteers can just cut broom. We post your broom events of a community on our website. We have signs to loan. We offer these things free of charge to willing volunteers. Be willing to chip up or pick up piles of broom that residents cut from public land. You can begin in very specific locations, or allow residents to cut on roads near their homes and schools. Public land only. We would need one contact person in the City to work with myself and the community coordinator about locations for cuts, etc., to be sure everyone is happy. This contact person is often from planning, parks or public works. To clarify, your city is in charge. Broombusters is only here to help and facilitate. Consider putting up a certain number of “Cut Broom in Bloom” signs in May to invite the public to get involved. An enthusiastic volunteer from the community to coordinate a cut or two (or more). It can take only a few hours a year. It’s COMMUNITY BUILDING. FUN. It promotes stewardship and community spirit. For the effectiveness of it, it’s relatively inexpensive. And it works! Broom will disappear, and as it does, more landowners will remove broom from their own properties. Pretty soon, everyone will know – CUT BROOM IN BLOOM. And broom will start to disappear as mysteriously as it appeared. Our executive director is happy to appear as a delegation to your town council or environmental committee. Find out what they want to do and what areas of town they care about.Ask them. Removing broom cut by volunteers on roads & in parks. Signs inform the public, make a statement & invite participation. Let the public know that the city wants to stop the spread of broom through newsletters, press releases, info sheets, etc. 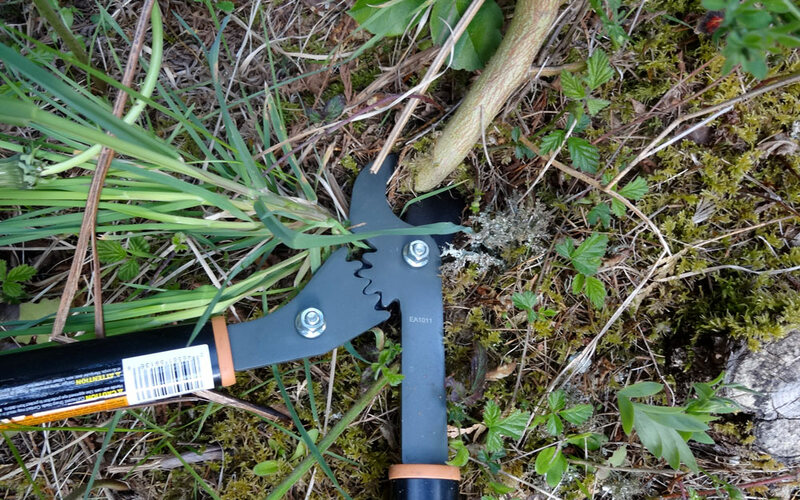 Nanaimo has two invasive plant drop zone days each year, for broom, ivy, gorse and other invasive plants. Parksville and Nanaimo have effective noxious weed by-laws. With loppers, at ground level, in late April – May. Do not pull. Just cut. Do not disturb the soil. No need to poison. Go after advancing edge & new infestations first. Create shade. Preserve trees & groundcover. Cut all yellow flowers to prevent seed formation. Communities, cities, media, ministries all working together with one goal. Stop the Bloomin’ Broom!